Well dear readers, it is another week and time for a new post. I must admit that my main inspiration for this post was my hair, but I do have to say that this ensemble I wore on Monday was so much fun and really made me feel like I had stepped back in time (more than usual of course)! Oh, where do I start? I suppose I will start with what I wore and end with my hairstyle :) Thus, here is the story behind what I wore......I have always loved the idea of a Nancy Drew inspired look, with pleated skirts loafers, maybe a sweater and sometimes a clotch hat (dreadfully missing from this ensemble). Therefore when I woke up Monday morning that was my inspiration and the fact that I had a new sweater vest from a dear friend that I was dying to wear. As you can tell from these first two photos, it was very cold Monday. Lets just say that I did started the day wearing loafers and ankle socks but quickly had to change into something warmer (when it dropped 20 degrees). I am sure that with this ensemble I received some unique stares as I went to class on Monday, but that is always the fun and humor of wearing vintage. However, enough with my ramblings, and on to talking about the important things!! 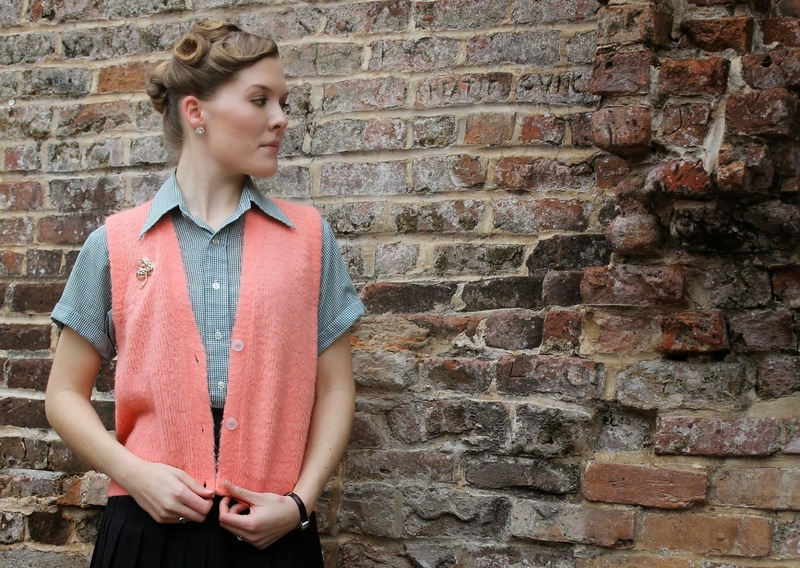 First off, can we all just take a minute to marvel at this coral/peach/pink sweater vest!! I absolutely LOVE it!! One of my dear friends gave it to me since she had never worn it and of course I was happy to give it a new home. I decided to pair the vest with a green and white 50's checkered button up (which was probably my dad or uncles growing up!). Of course, what is a wonderful sweater vest without a perfect skirt....and this skirt most certainly has to be one of my favorite finds from Goodwill. It is a pleated wool skirt with very tiny stripes that make up a barely distinguishable plaid print. I have always loved this skirt for the fact that I feel like Nancy Drew when I wear it; pulling out my magnifying glass, prepared to do some sleuthing (I don't know why?). I must say that I have been inspired these past couple of weeks with seeing all of the fabulous vintage hairstyles all over Instagram, and because of this, I decided to try something new. It has been almost a year since I did any kind of pin curls or victory rolls (yes, so sad) and I was really missing them! I guess I always think that they will take longer than straightening or curling my hair (which is not true) and I get lazy. However, Monday was different...I was determined to try. I have realized that hair is not only fun to do, but it can also add so much to a look and really add to the whole vintage theme that you are going for!! Before I started, I first had to get my annoying bangs (which are fairly grown out) out of the way by twisting them into a swooped side roll. Then I did another roll on my right side and pulled the hair from my left side over to the right and rolled it the same way. Last but not least, I took the rest of my hair and twisted it into a Cinnamon roll bun (that is what I like to call it) in the back. I was very pleased with the result, though I need to work on fixing my cobweb fly aways, but over all I was so excited to discover a new and easy vintage hairstyle. Have you tried any new hairstyles recently? 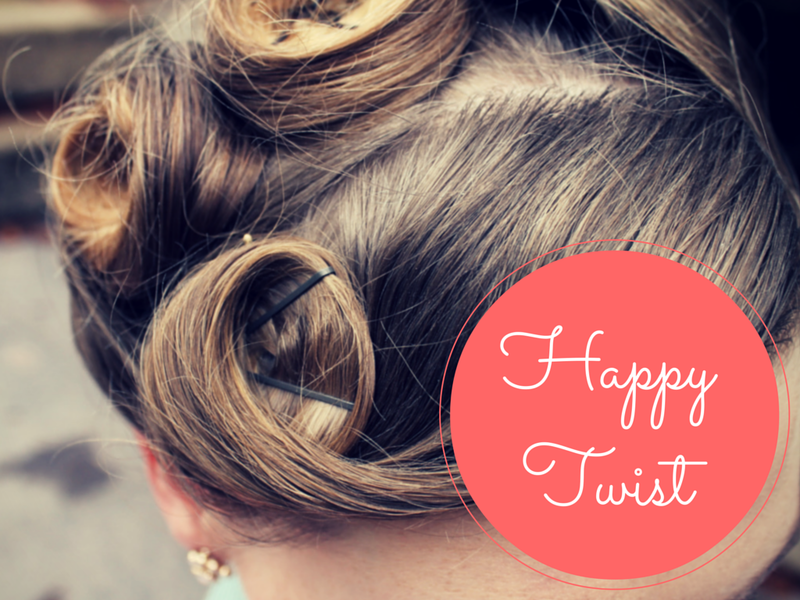 Do you think hairstyles add to a vintage ensemble? What is one of your favorite hairstyles? You are absolutely right Charlotte! I have always seen dainty magnifying glass necklaces on Modcloth and Etsy and I really need to grab one sometime :)!!!! I love your hairstyle and your shoes! And that coat is positively to die for! Such a cute outfit! Than you so much Brigid!! I love this outfit! That vest is fabulous! Do you take our own pictures? If so, do you have any tips? I believe you have commented before Natasha, and I am so glad you are enjoying my blog!!!! Second: I realized that since I focus my camera on the surroundings when I am not yet in the picture there is a focus range. Thus, I have to stand in that focus range. In this post for example my camera focused on the brick wall so standing close to it put me in focus. Third: there are hand held shitter buttons you can get which I wi hopefully invest in one day and that would make picture taking much easier and successful. Fourth: all pictures of my hair or close up shots of my accessories or face are taken selfie style, with me just holding the camera and snapping a picture:). Oh....and I use a tripod! !